Choosing the right Tarot card for this page created an interesting debate. Eventually I settled on the King of Pentacles. Pentacles is the Tarot suit that represents manifestation, the material world of physical sensations and is generally considered to represent the money aspect of life. The 6 of Pentacles was an option I considered and thought very suitable in the sense that it shows the ideal of giving of yourself in balanced measure - a bit here & a bit there. Then of course there is the 5 of Pentacles imagery foretelling material trouble with the needy ones in the cold, cold snow missing the window of opportunity or maybe passing it by because they couldn't afford the cost. So I have to find a balance that allows us to co-exist. In the end here we are with the King of Pentacles. The best way for me to get to a point of helping others through my Numerology and Tarot counselling is that this practice needs to be financially viable. 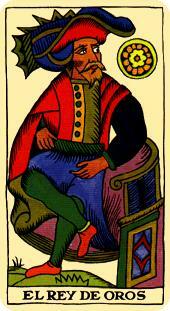 The King represents wisdom and practicality in the management of the material world - mature and dependable. I promise not to lose my nurturing, caring and understanding qualities found in the Queen of the suit. I believe in balancing the dual aspects of our personality and we all are a mix of masculine & feminine. Charging for my time for Tarot and Numerology counselling is difficult because I am driven by a desire to assist others who have a need for my kind of assistance. I'd like to think that you would recompense me what you consider my services were worth to you. I'm not against the idea of bartering - if you make wine or grow zucchinis and I'm in the market for these things then let's do a deal but I have to bite the bullet at some time - I can't pay my registration with zucchinis. I base my costs on the amount of $60.00 per hour. If I charge $30 then it is because it takes me 30 minutes. Personal Day, Month & Year; Cycles of Development & Peaks of Maturity. Hidden Resolve; comparison with common name & married name. 3 layouts of the 10 card Celtic Cross spread that starts with the current situation relevant to the question/scenario and drills down to the developing trends and future aspects. With every Tarot reading you also receive a Birth Date analysis Numerology Chart. Includes the Essence card, a Fairy card, a Rune stone and written summary & analysis. 1 layout of the 10 card Celtic Cross spread. Includes Essence card, Fairy card, Rune stone and written summary and analysis. 1st Hour (or part) - $60; followed by half hour sessions - $30 per half hour. The first consultation ($60) will usually be 1.5 hours giving time for settling, understanding and introductory discussion and then segments of time can be added. Counselling sessions will include a Numerology Chart and an in-depth Tarot Reading as this is my preferred way of working with you. I have a Certificate 3 in Advanced Counselling (QLD TAFE). Combined with a wealth of life experience acquired through 18 years of policing and interaction with people in many scenarios and situations, I have also received extensive counselling experience associated with my own journey as a victim of child abuse and a survivor of marital violence and abuse, marital breakdown, divorce and rebuilding. For a small group (3 or 4) I offer my basic $60.00 per hour rate plus the cost of materials and travelling time shared between the group members . For a larger group a cost and course outline based upon the number of interested people in the group and the learning goals would have to be developed to meet your needs. Please provide an outline for consideration.